← Leesburg, Florida. June 27th, 2011. 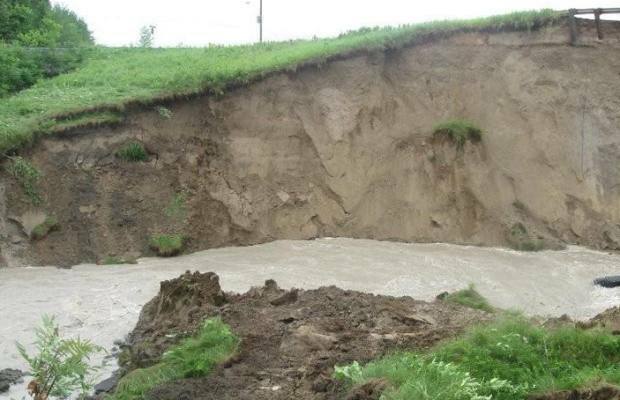 A piece of Highway 148 near Luskville is now a canyon 55 feet deep, a victim of Friday’s heavy rains. Remarkably, the family living next to the giant gap owns a construction company with expertise in exactly the type of work that will be needed to fix the road. Not only does James Nugent, of R.H. Nugent Construction, have 35 years of experience in the field, he has the heavy machinery parked only a few hundred meters from the caved-in road. Nugent said the large pipe that ran under that stretch of the highway seems to have been blocked at the intake. 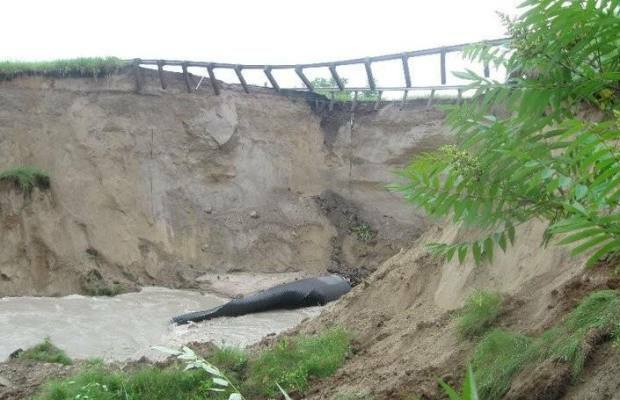 The torrents of water late last week stressed the situation causing the pipe to buckle and the ground above the pipe became waterlogged and gave way. Since the initial cave-in, the canyon has grown wider, with landslides from the edge happening several times. He said it will likely happen again and people should stay clear of the edge by 10 meters on either side. “It could let go any time,” he said. In the meantime, even with a company next door with expertise in replacing such pipes it will likely take six weeks to do the work, Nugent said. That will have major consequences for commuters, of course, as the main artery connecting Ottawa and Gatineau to the Pontiac will be out of commission for so much of the summer. One bit of good news is that a two kilometer detour is now open around the area. 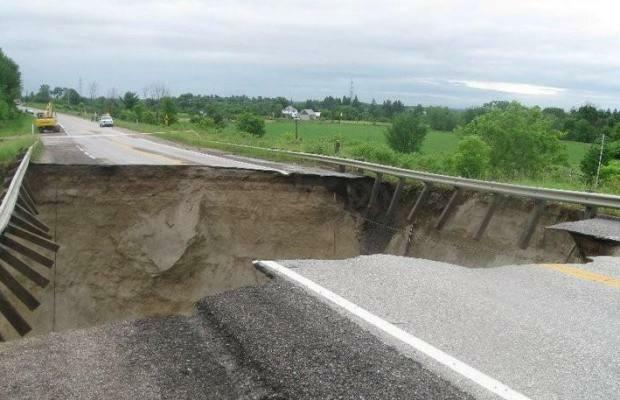 Eddie McCann, mayor of the town of Pontiac, said it took a lot of very fast work by municipal and provincial crews to repair Parker Road, which was also damaged by all the water. “It was impressive,” he said. The detour now runs through Parker, McKibbon and Curley Roads. McCann said that the roads have been widened in some areas with graders to help deal with the traffic. He said at first transport trucks will only be allowed through one at a time, until two corners on the detour that are very sharp turns right now can be improved. The canyon itself where part of the 148 used to be is a “shocking” site, McCann said after looking at it in person. Edith Nugent, James’s mother, said she was amazed by what she saw down the road from her house. “Never seen anything like it,” she said. For James Nugent, the disaster will mean he can work close to home this summer — although with one hitch. Until Friday, he lived one kilometer from his office. Now there’s a canyon in between. “I’m on one side, the office is on the other,” he said. Still, who can complain, when this type of job comes along next door. “It’s a great opportunity,” he said. Meanwhile, in Ottawa, Dunrobin Road remained closed through the weekend between Kilmaurs and Kinburn side roads. City spokesman Barre Campbell said he expected work to begin on the road on Monday. 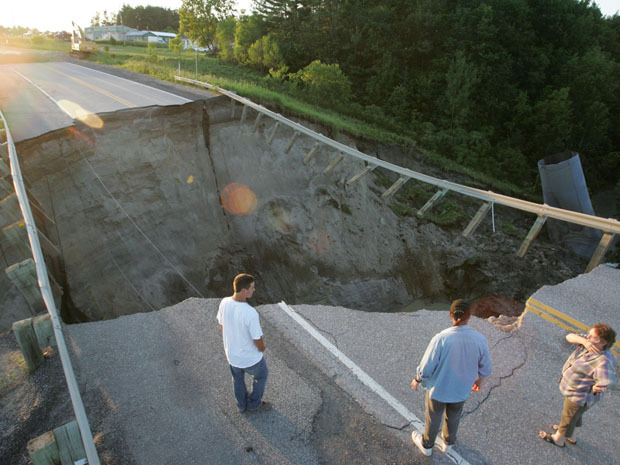 This entry was posted in Pictures and tagged Canada, Canada sinkhole, huge sinkhole, Luskville, Quebec, sinkhole. Bookmark the permalink. 1 Response to Luskville, Quebec, Canada. June 27th, 2011.